How can this be? Is this for real? I mean, I’m looking at what’s in front of me, I know what God has promised, but how in the world is it going to happen? Jesus said it, but did He really mean all things? I’m reminded of Joseph in the book of Genesis. Remember that poor guy? His brothers hated him so much they sold him into slavery, lied to their father about what happened to him and he ended up in Egypt. He did pretty well for himself until a false accusation landed him in prison. Then, after several years, Joseph went from prisoner to vice-pharaoh. Overnight! How? I’m reminded of the Israelites building the Tabernacle. They were instructed to use certain materials in certain ways with precise specifications. Once they completed it, God’s glory came and dwelled with them. They went from God speaking to them through a prophet to God dwelling in the same enclosure. In the blink of an eye! How? I’m reminded of a little boy with a sack lunch. It contained 2 loaves and 5 fish. Jesus blessed it, broke it, and turned it into a meal for thousands of people…and there were leftovers. How? I’m reminded of some disciples who had toiled all night trying to catch fish to provide for their families. They had thrown the net over and over and over and caught nothing. Jesus told them to cast their nets one more time and they caught so many fish they had to call partners in to help them because the catch was so great. After one more throw of the net. How? That’s all it takes with our God…one night, one blink of an eye, one offering of all He’s provided, one more throw of the net. How? Our God is for us. 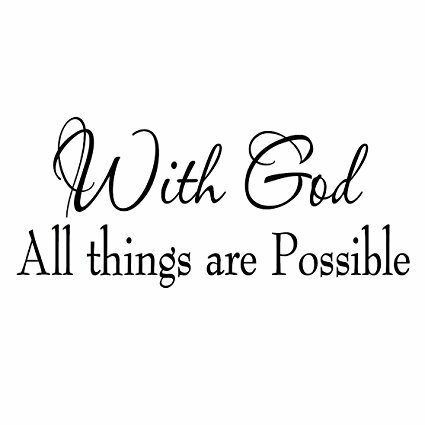 Our God is the God who takes the impossible and makes it possible. It is so frustrating to buy tomato juice at the grocery store only to discover another stack of homemade, well-preserved juice ready to use. Somehow, I always manage to shove a few jars behind some green beans, or jelly of some sort. They are forgotten for a time. When I finally find those jars, they can still be used, but oh, how great it would have been in that homemade soup last week!? Just like those forgotten jars of juice, we need to remember that God has provided for us. He has preserved us and established us with exactly what is needed. Sometimes though, His provision gets relegated to the back. Let’s ask Him to help us remember what has already been preserved in us. Let’s open up what He has already established in us! Let’s feast on what He has already provided. I’ve said for some time now that there is a certain crisis of faith that comes to every human when deciding whether they believe God can do what He says He can do. Can He really save me? Can He really heal? Can He really drop manna from the sky? And then, there is the crisis of faith that comes when you know without a doubt that God can move mountains, but He’s just not doing it for you. I mean, what is more frustrating than knowing that someone, anyone, can help, they’re just choosing not to? When that happens, a whole new crisis of faith occurs. Your mountain is looming large and you know your God can move it, but He’s choosing not to and you are left floundering with questions. Is my God really good? Can my God really be trusted? Does He really have a plan for my good? Do I really matter to Him? I’m not going to pretend to know all the answers to why God is allowing certain things in your life. I’m not even going to pretend to know why He is allowing certain things in my life. I’m not going to pretend to have the answers as to why God would allow children to have cancer, rapists to go free, or even why food can’t be put on every table this week? But, I can tell you (and me) what to focus on when God doesn’t do what we want Him to do. Let me start by assuring you that you do indeed have a good God. You have a God who does choose to move mountains for you. You have a God who wants you to look like Him and act like Him and love Him as He loves you. You have a never failing, never ceasing, never forsaking God who has a detailed plan for you since before the first molecule was on this earth. Know that because it’s true. This passage is so great. We get to see the struggle that Jeremiah had with what was happening all around him and to him. He couldn’t understand it and he became depressed. He even admits in this passage that he lost his hope in the Lord. Then, he decided to remember who His God is. He decided to think about God’s faithfulness, His love and His mercies. He decided that The Lord was his portion for this life and his hope. He decided to rest in God knowing that His God would come through. God’s deliverance obviously wouldn’t look like Jeremiah thought it would. It obviously wouldn’t come at the time that Jeremiah thought that it should, but Jeremiah decided to look up, remember His God and trust. That’s the kind of faith I want, don’t you? First John 1:5 tells us, “Now this is the message we have heard from Him and declare to you: God is light, and there is absolutely no darkness in Him.” You can trust that. Our God has no ulterior motives. He has no dark side. He is good. He is holy. He is true and He. Is. In. Love. With. You. Song of Solomon 7:10 says, “I am my beloved’s, and his desire is toward me.” God’s desire is toward you. God wants to be with you. He wants to be so melded with you that all people see is Him being uniquely displayed through your personality, your giftings and your sweet face. He has fashioned you for such a time as this and will not stop pursuing you until every fiber of your being is His. He is obsessed with you. Hebrews 13:5 says He will never leave us and Zephaniah 3:17 says He sings over us. That is not a God who fails. That is a God who loves. Believe that today. Know it with every fiber of your being. If you have to be like the father in Mark 9:24 who said, “I do believe!” and then, quickly added, “Help my unbelief,” so be it, but keep pressing in to your God. He can be trusted. He will come through. He will strengthen you for the task and He is worthy of every fragment of faith you place in Him. He has you, precious one. He has you. Rest in that today.